Battle Missions is an expansion for Warhammer 40,000 that contains more than thirty new missions for you to play. Each mission is designed to provide you with a battle that will really challenge your ability as a commander on the war-torn battlefields of the 41st Millennium. 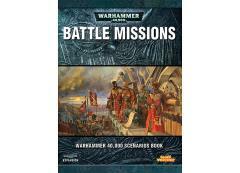 This 96-page scenarios book contains 30 new missions and three special missions for use in your games of Warhammer 40,000. This book also includes extensive background material and maps describing different battle strategies and tactics used by the armies of the 41st Millennium.